Used yellow, blue and green translucent beakers, lit from behind, to provide the coloured strips on a sheet of silver card. An orange warming filter on the camera turned the yellow to orange, and some cordial in the blue beaker helped with the purple. 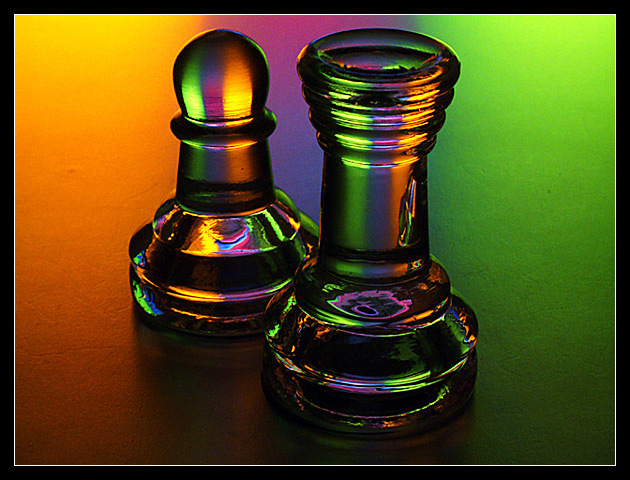 A couple of glass chess pieces finish the shot off. Heavily influenced by the work of Scab-Lab. I find it very difficult to make "helpful" comments on such great shots. Especially ones where I can find nothing wrong. If I HAD to find something 'wrong'I would say that I wish this had been on a smoothe surface, with no scratches, and I would say that I think that the pawn is tilted a little to the left. Simple 'solutions' would be to use a poster board or something for the background, and to straighten up the pawn. Simply beautiful. I really love the colors, and the USE of colors mostly. The color is definately the main subject here. You can actually almost overlook the fact that those are chess pieces and be so engrossed in the fact that the color is going through them, that they are actually a rather unimportant part of the shot. AND with the purpose of this challenge, I think that is what makes this photo so great. Focus and clarity are also really great. I have tried to photograph these same chess pieces, and had a heck of a time doing it. I congratulate you. A wonderful work that I could see hanging somewhere. Congrats! Good to see you giving scab-lab some props. I knew there was a strong resemblence. Great pic. Top 3 - and my fave of the week. Excellent shot - I love the refraction and the fact that you got it WITHOUT a wine glass. Hazarding a guess - bod? 10 either way. I love this photo! Are those just orange, purple and green lights shone on there or is it something else? I love how the green, purple, and orange show up through the chess pieces. Clear and intriguing photo. Lovely colours (how did you generate them?) and the refraction in the pieces is very effective. Good one. I love the darkness in this shot - somewhat sinisiter. The colours and the way they are refracted by the glass is wonderful - would have been good in that challenge to. I would like a touch more space above and maybe a little below the pieces, not a huge amount though. Very nice. Perfect realisation! I wish I had make it! Congratulation. this is a really interesting image, how did you achieve this effect? Compelling composition. The colors are handled very well. WOW! So clear, sharp, and colorful. Great composition. Super job! I love the colour and the effect in the glass. For more impact I would have cropped tightly to the edge of the chess pieces. The orange and the green on the edges is distracting. Beautiful. A perfect 10. Love the colored lighting and how it reflects on the surface and in the glass pieces. The tiniest nit pick I have is that I would like to see this on a perfectly smooth surface. Nice work. very cool the prism effect and lighting, and nice detail/focus. The color mix is so amazing. Perfect lighting, congratulations on a wonderful photo - 10. I loke this pic. well done. how did you do the background? I like the blured lines between the three colours of the background? Proudly hosted by Sargasso Networks. Current Server Time: 04/19/2019 01:07:19 PM EDT.